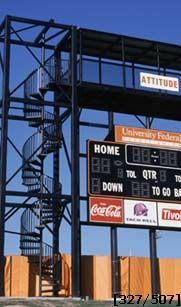 This spiral staircase provides access to a football practice facility observation tower. It is a 60" diameter stair and is approximately 40' tall. The spiral stair was fabricated in one section and then spliced into three sections for shipment and reassembly at the job site. The treads are constructed out of 12 gauge checker plate steel. There are four 1" square balusters per tread for a minimum of 4" spacing per UBC code. The spiral stair handrail is a 1 1/2" round tubing. The center column is a 3 1/2" ID schedule 40 round pipe with lateral braces at the mid point. The spiral staircaser was shipped with a red oxide primer with a coat of semi gloss black paint applied by the owner at location.